A new political map for New Britain is nearing completion with changes to ward lines, voting districts and polling places for the November Presidential election. The Democratic Town Committee will review a final draft of the map at its April 26th meeting to be held at New Britain City Hall’s Room 305 beginning at 7 p.m. With re-districting already settled for Congress and legislative seats the changes now being made by the Council will complete the process that comes every 10 years in accordance with the Census. Also on the agenda for the meeting will be the formation of DTC standing and ad hoc committees including Finance, Rules, Publicity, Hospitality and Voter Registration/GOTV. Congressional candidate Elizabeth Esty will be a guest speaker. State convention delegates from Berlin, Farmington and New Britain will meet Tuesday, April 24th to elect a man and a woman to represent the 6th Senate District on the Democratic State Central Committee. Berlin’s Kevin Murphy and New Britain’s Emma Pierce are seeking re-election to the 72-member state party committee. Democrats to serve on state convention committees will also be selected at the meeting that will be held at Pride of Connecticut Lodge of Elks, 24 Elm Street, New Britain. The State Convention will be held May 12th at Central Connecticut State University in New Britain when a candidate for U.S. Senate will be endorsed. Alton Brooks, a founding director of the city’s anti-poverty agency, city commissioner, coach and longtime member of the DTC, will receive statewide honors in May with a Lifetime Achievement Award from the CT African-American Affairs Commission (AAAC). For 12 years the AAAC has recognized outstanding Connecticut African-American men, women, business and economic development leaders, lifetime achievers and high school students. Honors were bestowed on Connecticut residents who contributed to the quality of life of Connecticut’s African- American communities. 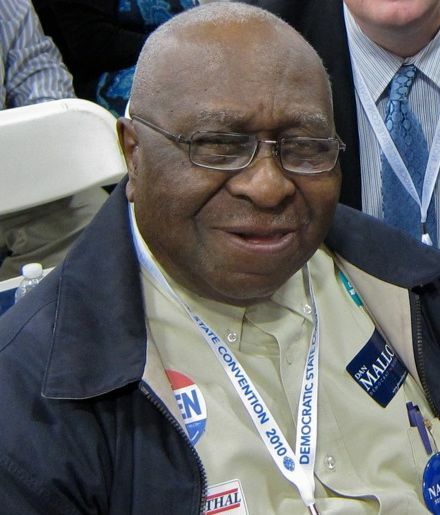 Brooks, 90, is one of the most active DTC members and continues to be a tireless activist for civil rights,youth employment and economic justice in his community. This entry was posted in Civil Rights, Environment, Meeting/Event, Weekend Update. Bookmark the permalink.